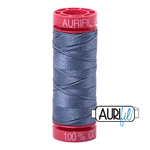 Aurifil Thread 12 wt is superb for art quilting when heavier thread effects are desired . Beautiful on linen and denim fabric . Use a 90/14 topstitch needle. Achieve great results using 12wt for Machine Sashiko. 12wt is perfect for Red-work and Stitchery .